“During our annual impact review in 2014 we saw an opportunity to help the most vulnerable kids in the township of Philippi by providing desperately needed free school breakfasts through the Afri-CAN Cafes. We focused our efforts on those children between 1 and 6 years old, where brain development through nutrition is at the most crucial growth stage. During the first 6 month review of the program we were already hearing of significant positive results in those children, we were all really pleased with these results and were now confident enough to ramp up the program to our two year target of providing over 100,000 free school breakfasts a year in the area. The senior Afri-CAN Children’s Charity team visited the recipients of the free school breakfasts. We visited around 6 Early Childhood Development Centre’s (nurseries). Then everything changed..
What we found was decent, dedicated staff but in the most appalling conditions for those teachers and the children. Damp, dark and totally unacceptable conditions of deprivation at the makeshift ECD Centres. Over the years we’ve learned that aid support is rarely binary, it forms a matrix. There’s little point in providing free school breakfasts for children if their accommodation for the majority of the day is in filthy unsanitary conditions. Frankly if we did nothing the free breakfasts would have been more about us and how we felt we were contributing than actually dealing with the challenges of giving these vulnerable children the best start we could and to give them the platform to have a strong ECD Centre education. Education is the primary route out of extreme poverty. The decision was made to immediately and urgently review the program to provide an integrated sustainable solution. Today we build brand new ECD Centres using simple but effective construction materials and create clean and safe environments for the children, we provide teacher training courses to improve staff skill sets, every child receives a nutritious free breakfast, we provide entrepreneurial support for the teachers when we hand over ownership of the ECD Centres on a perpetual licence upon completion. In addition we provide children with a fun durable tracksuit ‘school uniform’ and additional educational aids – we have come a very, very long way from serving free school breakfasts. 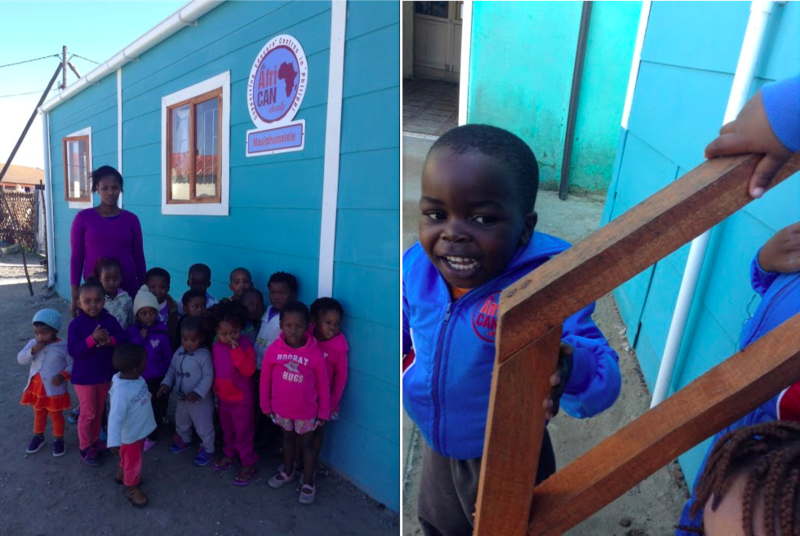 Every one of our ECD Centres is a new sustainable business, run and owned by the teachers. In 2015 we’ll have built 10 new ECDs, creating 10 new businesses, supporting over 60 full time staff, providing food and education to over 750 children and allowing around 500 women to regularly seek work or maintain jobs knowing their children are in the best conditions. Our mantra of ‘support, act, learn and adapt’ never seemed more pertinent. Over the coming years we hope to reach thousands of children and all those community members benefiting from the work of the Afri-CAN Children’s Charity ECD Centre program.”– Stefan Allesch-Taylor CBE The Afri-CAN Children’s Charity Founder and Chairman. This entry was posted in Afri-CAN South Africa and tagged ECD, New Nursery Building Program.